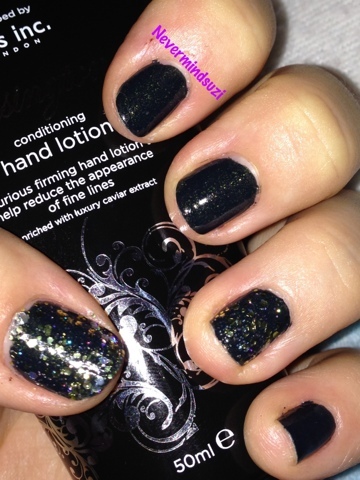 Another of the gorgeos James Bond polishes for you today ... Live and Let Die. A smoky black filled with golden shimmer. Smooth application and 2 coats for full opacity. I decided to try out 1 of my long ignored but much lusted after Barry M glitters and went with Yellow Topaz on my ring and thumb. Talk about sparkle and when the light hit it the bling was unbelievable.